I’m truly honored by this award, and more than a little humbled by the pedigree of its previous winners. The NPF’s Chairman’s Citation was last awarded in 2012 to the late, great New York Times reporter Anthony Shadid, who died in Syria that same year. Shadid, a two-time Pulitzer Prize winner, was also a former Washington Post reporter. Likewise, the award was presented in 2010 to Colbert King, a Pulitzer Prize-winning columnist at The Post. This honor also gives me another opportunity and platform for proselytizing to media colleagues about the merits and rewards of being an independent journalist. Some of my reporter friends probably get sick of hearing it from me, but there has never been a more important time for reporters who are passionate about creating original, impactful content to consider going it alone. A diversity of authoritative (and accountable) voices on important topics keeps the mainstream media honest and on its toes. More crucially, it helps inspire and cultivate the next generation of the Fourth Estate. 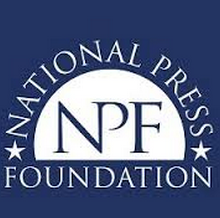 A hearty “THANK YOU” to the NPF for this recognition, and to the faithful readers here who make this all worthwhile!